This paper investigates L2 learners’ use of intonation in reference maintenance in comparison to native speakers at three longitudinal points. Nominal referring expressions were elicited from two untutored Turkish learners of Dutch and five native speakers of Dutch via a film retelling task, and were analysed in terms of pitch span and word duration. Effects of two types of change in information states were examined, between new and given and between new and accessible. We found native-like use of word duration in both types of change early on but different performances between learners and development over time in one learner in the use of pitch span. Further, the use of morphosyntactic devices had different effects on the two learners. The inter-learner differences and late systematic use of pitch span, in spite of similar use of pitch span in learners’ L1 and L2, suggest that learning may play a role in the acquisition of intonation as a device for reference maintenance. Cet article compare l’emploi de l’intonation dans le maintien de la référence par les locuteurs natifs et par les apprenants L2 dans une perspective longitudinale. L’analyse porte sur la durée et la hauteur de la voix dans les expressions nominales employées par deux apprenants turcs du néerlandais (apprenants sans tuteurs) et cinq locuteurs natifs du néerlandais dans des narrations suscitées à partir d’un film et cherche à examiner les effets des changements d’accessibilité et de similarité référentielle. Les effets de deux types de changement d’information ont été examinés, entre information « nouvelle » et « donnée », et entre information « nouvelle » et « accessible ». L’étude montre que les apprenants peuvent adapter la durée en fonction des changements d’accessibilité et de similarité référentielle relativement tôt. En revanche, on note des différences de performance entre les apprenants, ainsi qu’un développement dans l’usage de la hauteur de la voix d’un apprenant avec le temps. De plus, on observe que l’emploi d’outils morphosyntaxiques a des effets différents chez les apprenants. L’emploi systématique tardif de la hauteur de la voix et les différences entre les locuteurs suggèrent que, malgré l’emploi similaire de la hauteur chez les apprenants L1 et L2, l’apprentissage joue un rôle dans l’acquisition de l’intonation comme outil du maintien de la référence. 1Referring to entities is an indispensable element of everyday communication. When referring, the speaker varies the lexical expression, the intonation of the lexical expression or both according to the information state (or activation state) of the referent to the addressee (Chafe 1987; Lambrecht 1994).1 In doing so, the speaker makes it possible for the addressee to track referents in fast evolving discourse. On the assumption that different types of mental effort or ‘cost’ are involved in the processing of referents, Chafe (1987: 22) distinguishes three information states, active (or given), semi-active (or accessible), and inactive (or new). If a referent is already in the addressee’s focus of consciousness at the time of the utterance, it is given. If a referent is still in the addressee’s long-term memory, not active in any way, it is new. If a referent is in the addressee’s peripheral consciousness and is not directly focused on, it is accessible. A referent can become accessible either by having been active at an earlier point in the discourse or by being inferable from an already active or accessible referent. Lambrecht (1994: 100) refers to these two kinds of accessibility as ‘textually accessible’ and ‘inferentially accessible’ respectively. In addition, he proposes a third kind of accessibility, ‘situationally accessible’, whereby a referent is accessible due to its presence in the text-external world (e.g. the referent of ‘waitress’ is accessible if mentioned in a restaurant). A given referent is encoded with lack of accentuation and typically a pronominal expression or zero anaphora; a new referent is typically encoded with an accented noun phrase (Chafe 1987; Lambrecht 1994). A given referent may also be expressed with a noun phrase but without accentuation because of various semantic and stylistic reasons, for example, when the pronominal coding can lead to ambiguity as in ‘I saw John and Bill this morning. He was sick’ (Lambrecht 1994: 95). An accessible referent appears to be encoded with a noun phrase and optional accentuation, depending on the nature of the referent. For example, Baumann and Grice (2006) found that a referring expression is preferably unaccented if the accessible referent has a part-whole relation with the already active referent but is preferably accented if it has a whole-part relation with the already active referent. 2Although accent placement (accented vs. unaccented) plays a significant role in encoding information states, recent studies have shown that the exact intonation pattern in the accented referring expression (i.e. accent type) also matters. For example, Baumann and colleagues (Baumann and Hadelich 2003; Baumann and Grice 2006) found that in German the falling accent with an early peak is more favoured than the falling accent with a medial peak in encoding new referents, but the falling accent with a medial peak is preferred in encoding certain types of accessible referents. Chen et al. (2007) showed that in British English the falling accent is associated with new referents but the rising accent is associated with given referents, like unaccenting. 3So far the intonation of referring expressions has been treated as a discrete property and described from a phonological perspective, i.e. in terms of accent placement and type of accent. Variations in the intonation of referring expressions can also be captured from a phonetic perspective, i.e. in terms of gradient changes in pitch, duration and intensity of the referring expressions. A referent with a low degree of activation tends to be encoded with a higher pitch, a longer duration and a higher intensity than a referent with a high degree of activation in languages like English (Arnold 2008).2 This pattern holds even when referents are produced with accentuation (Watson et al. 2007). Turning to making reference in a second language (L2), L2 learners’ use of referring expressions has been widely studied in different L1-L2 pairings. The general finding is that, although choice of referring expressions is by and large governed by information states of the referents across languages, L2 learners from different L1 backgrounds experience difficulty in using the appropriate expressions for reference to given referents (also referred to as ‘maintained referents’ in the relevant L2 literature). Following an initial stage of frequent omission of topical referents, they tend to overuse noun phrases to refer to maintained referents at the intermediate stage (Hendriks 2003 and references therein). As a result, intermediate L2 learners tend to be overexplicit in reference maintenance. The excerpt in (1) illustrates this point. It was produced by a Turkish learner of Dutch when retelling Charlie Chaplin’s film ‘a dog’s life’ (this study). 4Accounts for intermediate L2 learners’ overuse of noun phrases in reference maintenance have been put forward from different perspectives, including cognitive load, communicational demand, and organisation of information (See Hendriks 2003; Gullberg 2006 for more discussion). Briefly, intermediate L2 learners have knowledge of the information states of the referents shared with the addressee but they are unable to adjust their choice of linguistic expressions accordingly due to heavy cognitive load resulting from speech planning at both the level of the clause and beyond (e.g. Carroll et al. 2000), or to a tendency to avoid error-prone pronominal forms (Williams 1988), or to linking short utterances in a way that is infelicitous to the use of pronominal forms or zero anaphora (Véronique et al. 2000, as cited in Hendriks 2003). 5In contrast, little is known about intermediate L2 learners’ use of intonation in reference maintenance. It is still an open question whether they adjust the intonation of noun phrases according to changes in information states. To date, work on L2 intonation is mostly concerned with the production and perception of intonation as a component of the sound system of L2 (see Chen, 2009b for a brief literature review). The use of intonation in reference maintenance has not been investigated in L2 learners. Earlier studies that address related issues are also very few. These studies are mostly concerned with learners’ intonational encoding of contrastive focus in isolated sentences (e.g. ‘I BOUGHT a cat there’ vs. ‘I bought a CAT there’) read out from a recording script (Ueyama and June 1998; Chen et al. 2001; Yeou 2004). Rasier and Hiligsmann (2007) and Wennerstrom (1994) are exceptions in that they analysed L2 learners’ use of intonation to mark information states in a richer discourse than isolated sentences. 6Rasier and Hiligsmann (2007) asked intermediate French learners of Dutch and Dutch learners of French to describe geometrical figures appearing on a computer screen in both their L1 and L2. The figure shown at a given time differed from the preceding figure in colour or in shape or in both, creating a contrast on the colour or on the shape or on both. Rasier and Hiligsmann found a strong L1 influence on L2 learners’ use of accent placement, causing the overuse of the double-accent pattern in L2 Dutch across conditions and the overuse of unaccenting in the colour adjectives in L2 French when the colour was the given information. Wennerstrom (1994) elicited both read and spontaneous speech from Japanese, Thai, and Spanish learners of American English at the intermediate level, as well as from native speakers of American English by means of a text reading task and a picture description task. She found that in read speech, native speakers of American English increased pitch in words carrying contrastive information relative to the preceding auxiliary (e.g. the word ‘sun’ in ‘In Spring, Seattle is usually wet. Meanwhile, other cities are having sun.’), but lowered pitch in words carrying given information relative to the first mention of the same words (e.g. the second mention of the word ‘rain’ in ‘In a light rain, you may not get wet, but in a hard rain, you will’). In contrast, speakers in none of the L2 learner groups increased pitch in words carrying contrastive information, although the Japanese learners lowered it in words conveying given information. In spontaneous speech, native speakers of American English increased pitch in words carrying new information but did not lower it in words carrying given information relative to the preceding copula. According to Wennerstrom, the words carrying given information might be reintroduced in the discourse and therefore were not pronounced with a lowered pitch. Among the three groups of learners, only the Japanese learners increased pitch in words carrying new information. The L1-like use of high pitch in the Japanese learners was attributed to their greater exposure to spoken American English than the Thai learners and to the fact that Japanese is a pitch accent language, which uses a fixed set of accent patterns to express lexical differences. However, among the learners, the Spanish learners had the greatest exposure to American English. Further, Spanish is an intonation language, like American English. Yet the Spanish learners did not resemble native speakers of American English more than the Japanese learners in the use of pitch. This seriously undermined Wennerstrom’s explanation for the Japanese learners’ performance. Taken together, results from these two studies suggest that the use of intonation in encoding information states in L1 can but need not be transferred to L2 and that intermediate learners with certain L1-L2 pairings have difficulty in encoding information states intonationally in L2. 7The present study set out to obtain a first insight into intermediate L2 learners’ use of intonation in reference maintenance. To this end, we conducted two case studies, investigating how two Turkish learners of Dutch varied intonation in noun phrases encoding accessible as well as given referents in spontaneous speech at different longitudinal points compared to native speakers of Dutch. Specifically, we addressed two questions. First, how do the learners differ from native speakers of Dutch? Second, is there a development over time in the learners? 8Intonation was analysed from a phonetic perspective because the learners’ production did not allow a reliable phonological analysis. They had no clear production of accentuation and hardly varied the shape of the pitch contour in the target noun phrases. As the recording quality of the learners’ data was not optimal for measuring intensity, we restricted the phonetic analysis to variations in pitch and duration . There is a range of pitch-related and duration-related variables that can be measured. With respect to pitch, we measured pitch span of the lexical word in noun phrases, defined as the difference between the highest and the lowest pitch over a stretch of speech (Cruttenden 1997: 47, 123-124; Ladd 1996: 260-261). Related to pitch span is the variable pitch register, defined as the mean pitch over a stretch of speech. Between the two, pitch span is assumed to be the primary variable for expressing attributes that can be associated with an increase in articulatory effort in the speaker, such as informational newness (Gussenhoven 2004: 85-88). With respect to duration, we chose to measure the duration of the lexical word in noun phrases rather than the duration of the stressed syllable, unstressed syllables, and stressed vowel of the lexical word, for two reasons. First, past work has shown that properties like newness and contrastiveness tend to increase the duration of the whole word instead of only parts of the word and the increase is most substantial at the word level across languages (e.g. Cooper et al. 1985; Eefting 1991; Hanssen et al. 2008; Y. Chen 2006; A. Chen 2009a). Second, the learners’ production was somewhat slurred at the segmental level and did not lend itself easily to accurate segmentation at the syllable and phoneme level; inaccurate segmentation could result in unreliable duration measurements. 9Variation in pitch span and word duration was examined in two types of change in information states: (1) between new (i.e. first mention of a referent) and given (all subsequent mentions of that referent); and (2) between new and accessible. An accessible referent was operationalised as a referent that belonged to the same category as an already active referent and was mentioned for the first time at the moment of the utterance (e.g. a second policeman). In Lambrecht’s terms, such a referent may be considered inferentially accessible. 10Our speakers were two untutored Turkish learners of Dutch, Abdullah and Mahmut, and five native speakers of Dutch (the controls). Abdullah and Mahmut participated in a large-scale longitudinal study on learner varieties conducted in the 1980’s and 1990’s in Europe (Perdue 1993). Like the other L2 learners in the longitudinal study, Abdullah and Mahmut were immigrants and they were recruited for the study shortly after their arrival in the Netherlands. They were interviewed at an interval of four to six weeks over a period of approximately 30 months. During each interview, they were asked to perform a number of tasks (e.g. free conversation, film retelling, role play). In the present study, we focused on Abdullah’s and Mahmut’s productions elicited by means of the film retelling task at three longitudinal points: 1) 6 months after the start of data collection, 2) 16 months after the start of data collection, 3) months after the start of data collection). Table 1 shows the background information on the two learners, including gender, region of origin, age, length of stay in the Netherlands, level of Dutch, and amount of contact with Dutch people. The information on the last four items was provided relative to the time of the first interview. The two learners were similar in all respects, though Abdullah seemed to have more contact with Dutch people than Mahmut in the course of the data collection. The five native speakers of Dutch (2 males, 3 females) were students from Radboud University Nijmegen aged between 18 and 25. They were paid a small fee for their participation. 11In this task, participants were asked to retell Part I of Charlie Chaplin’s film ‘a dog’s life’ to a native interlocutor. In the film, a vagrant, played by Charlie Chaplin, successively got into trouble with three policemen after he had attempted to steal a sausage. This part of the film was therefore very suitable for eliciting nominal expressions making reference to the policemen, in which the two types of change in information states were implemented. The learners’ data were available in the European Science Foundation (ESF) database on second language resulting from the longitudinal study on learner varieties (Perdue 1993). The database was digitised at the Max Planck Institute for Psycholinguistics (MPI) and is accessible to the general public via the MPI web interface. At the first longitudinal point, to make the task easier for the learners, the native interlocutor played the film in short fragments for the learners and asked them to retell what they saw after each fragment. At the later longitudinal points, the learners watched the film in one go and retold the film to the interlocutor who did not watch the film with them. Some of the ESF recordings were not of high quality (i.e. low amplitude and low sound-to-noise ratio). But as a whole, the recording quality allowed reliable analysis of word duration and pitch span. 12The native speakers of Dutch watched the film on their own and then retold the film to an experimenter in an experimental room at the MPI. They were instructed to retell the film in as much detail as possible and to be consistent in their choice of words. Each speaker was recorded with an external high-quality microphone connected to a flash-card recorder at 44.1 kHz sampling rate with 32-bit resolution. The microphone was placed 10-15 cm away from the mouth of the speaker during the recording. 14For example, the label ‘p_1_m_7_sub_nini’ stands for the expression politieagent, used for the 1st policeman at the 7th mention, preceded by neither an article nor a modifier, serving as sentence subject, and occurring in non-phrase initial position (e.g. dan politieagent komt bij ‘then policeman comes around’). 16When labelling the pitch-related landmarks, we discarded micro-prosodic effects (e.g. pitch rise and fall caused by transition from a consonant to a vowel or from a vowel to a consonant) by searching for the highest and lowest pitch after the first three to five periods of the onset voiced portion and before the last one to three periods of the offset voiced portion of the noun. Halving- and doubling- errors in pitch tracking were corrected manually. Figure 1. Annotation done for the lexical expression used in the 7th mention to the first policeman in Abdullah’s data. 17The expression was politieagent, served as sentence subject and occurred in non-phrase initial position. It occurred in the phrase ‘then policeman comes around’. The H and L landmark indicate the points at which the highest pitch and the lowest pitch were reached respectively. 18Pitch values (in semitones with 1 Hz as the reference point) at the pitch-related landmarks and duration (in seconds) of the nominal referring expressions on the word tier were automatically extracted by means of Praat scripts. Errors were manually corrected afterwards. Two measurements were then obtained from each nominal referring expression. 19A total of 63 lexical expressions referring to the policemen occurred in L1 Dutch speakers’ film retelling. Table 2 shows the distribution of nominal (prototype: politieagent, other: agent, eentje ‘one’, opzichter ‘supervisor’) and pronominal expressions (singular: hij, die, plural: ze ‘they’, z’ntweën ‘they two’) in the production of each speaker. Speaker 3 produced much fewer lexical referring expressions than the other four speakers because she retold the film rather briefly. For the purpose of the present study, we analysed duration and pitch span of the prototype nominal expressions only. Among the 32 tokens of politieagent, seven were considered not usable for one of the following reasons: (1) false start; (2) produced after laughter; (3) preceding disfluency and therefore produced with a very slow speaking rate; and (4) referential identity unidentifiable. This amounted to 25 usable tokens of politieagent for the phonetic analysis. In most of the cases, the expression politieagent served as sentence subject (subject: 68%, object: 24%, other: 12%) and occurred in non-phrase final position, including both phrase-initial and non-phrase initial position (84% in non-phrase final position vs. 16% in phrase-final position). As change in grammatical role can lead to change in degree of activation (Arnold 2008) and phrase-final lexical words typically get lengthened, we included into the phonetic analysis only the tokens of politieagent (n = 18) that served as sentence subject and occurred in non-phrase final position in order to avoid misinterpreting changes in duration and pitch span primarily caused by factors other than givenness and accessibility. In the second column of Table 2, the number of tokens included for the phonetic analysis is indicated in brackets for each speaker. 20‘Prototype’ stands for the expression politieagent; ‘other’ includes agent ‘agent’, eentje ‘one’, overzichter ‘supervisor’. Singular pronominal expressions include hij ‘he’, die ‘this’; plural pronominal expressions include ze ‘they’, z’ntweën ‘they two’. The number of prototype tokens included in the phonetic analysis is indicated in brackets for each speaker. 21We conducted two pairs of comparisons in word duration and pitch-span: (1) between first mentions of a policeman and subsequent mentions of the same policeman; (2) among first mentions of the three policemen. As only the first policeman was frequently mentioned in the retelling, the first comparison was restricted to first mentions and subsequent mentions of this referent. The first pair of comparison examined the effect of the change from newness to givenness on intonation; the second pair of comparison examined the effect of the change from newness to being accessible as well as an increase in accessibility (i.e. a second policeman vs. a third policeman) on intonation. 22With respect to word duration, the mean duration of first mentions of the first policeman was 50 ms longer than the mean duration of subsequent mentions of the first policeman, as shown in Figure 2 (left panel). This indicates that givenness led to a decrease in word duration. Further, first mentions of the first policeman were on average 41 ms longer than first mentions of the second policeman, which were in turn 84 ms longer than first mentions of the third policeman (Figure 2, right panel). Thus, accessibility also led to a decrease in word duration; an increase in accessibility led to more decrease in word duration. 23‘p’ stands for politieagent ‘policeman’; ‘m’ stands for ‘mention’. The digit following ‘p’ refers to the identity of the policemen; digit ‘1’ after ‘m’ stands for the first mention. 24With respect to pitch span, the mean pitch span was about 0.6 st larger in first mentions of the first policeman than in subsequent mentions of the first policeman (Figure 3, left panel). Furthermore, the mean pitch span was over 0.6 st larger in first mentions of the first policeman than in first mentions of the second and third policeman (Figure 3, right panel). Clearly, both givenness and accessibility led to a decrease in pitch span. But an increase in accessibility did not result in a more reduced pitch span. 25‘p’ stands for politieagent ‘policeman’; ‘m’ stands for ‘mention’. The digit following ‘p’ refers to the identity of the policemen; digit ‘1’ after ‘m’ stands for the first mention. 26Thirteen lexical expressions referring to the policemen occurred in Abdullah’s film retelling at the first longitudinal point (after about 18 months in the Netherlands). One of the 13 expressions was the pronoun hij, used for the second mention of the first policeman. Sixteen lexical expressions referring to the policeman occurred at the second longitudinal point (after about 28 months in the Netherlands) and 25 at the third longitudinal point (after about 38 months in the Netherlands). The use of pronouns increased to four and five times at the second and third longitudinal point respectively but was restricted to the use of the 3rd person singular. Table 3 shows the distribution of nominal expressions (prototype: politie at the first longitudinal point, politieagent at the second and third longitudinal point, other: agent and politie) and pronominal expressions (3rd person singular: hij) at each longitudinal point of Abdullah. The nominal expressions occurred closely one after the other at all three longitudinal points. Notably, Abdullah could use modifiers like nog een ‘yet another’ and andere ‘another’ in combination with the nominal expression to refer to the second and third policeman already at the first longitudinal point. 27Similarly to the data of L1 Dutch speakers, most of the nominal referring expressions served as sentence subject (subject: 70%, object: 20%, other: 10%). But there was more variation in position (65% in non-phrase final position, 35% in phrase-final position) in Abdullah’s data. Further, a number of nominal referring expressions were produced in a contrastive context (e.g. politie is buiten, hij is binnen ‘policeman is inside, he is outside’) and thus spoken with a longer duration and wider pitch span. Again, to avoid misinterpreting changes in duration and pitch span primarily caused by factors other than accessibility and givenness, we conducted the phonetic analysis on a selection of nominal referring expressions that were largely homogenous in terms of position (predominantly non-phrase final) and grammatical role (predominantly subject), and were produced neither in a contrastive context nor with a continuation rise. This selection of referring expressions consisted of four tokens of politie at the first longitudinal point, five tokens of politieagent at the second longitudinal point and six tokens of politieagent at the third longitudinal point, as indicated in brackets in the second column of Table 3. 28‘Prototype’ stands for politie ‘police’ at the first longitudinal point, politieagent ‘policeman’ at the second and third longitudinal point; other includes agent ‘agent’ and politie ‘police’. The pronominal expression used is hij ‘he’. The number of prototype tokens included in the phonetic analysis is indicated in brackets for each longitudinal point. 29With respect to word duration, similar patterns emerged at the three longitudinal points. First, the first mention of the first policeman was longer than subsequent mentions of this referent, as shown in Figure 4. Among first mentions, the first mention of the first policeman was longer than the first mention of the second policeman, which was in turn longer than the first mention of the third policeman, as shown in Figure 5. The decrease in duration along with the increase in accessibility was maintained in spite of the fact that first mentions of the second and third policeman occurred in phrase-final position. These patterns indicate that, like L1 Dutch speakers, Abdullah shortened the duration of the nominal referring expressions in the presence of givenness and accessibility, and even more in the presence of increased accessibility. 30‘p’ stands for politieagent ‘policeman’; ‘m’ stands for ‘mention’. The digit following ‘p’ refers to the identity of the policemen; the digit after ‘m’ refers to the nth of mention. 31‘p’ stands for politieagent ‘policeman’; ‘m’ stands for ‘mention’. The digit following ‘p’ refers to the identity of the policemen; the digit after ‘m’ refers to the nth of mention. 32With respect to pitch span, the nominal referring expressions were largely spoken with an almost flat pitch pattern at the first longitudinal point but a noticeably wider pitch span was used at the later longitudinal points. It has been suggested that L2 learners may not feel very comfortable about communicating in L2 due to limited experience and that they consequently tend to speak with a small pitch span (e.g. Ullakonoja 2007). The increase in pitch span over time may thus suggest that Abdullah became more confident about speaking Dutch. At the second and third longitudinal point, the first mention of the first policeman was spoken with a wider pitch span than each of the subsequent mentions of this referent. There was also a decrease in pitch span from an earlier subsequent mention to a later subsequent mention of the first policeman, as can be seen in Figure 6. However, there was little difference in pitch span among first mentions of the policemen at the second longitudinal point. Interestingly, at the third longitudinal point, the first mention of the second policeman was spoken with a wider pitch span than the first mention of the first policeman and the first mention of the third policeman was spoken with a wider pitch span than the first mention of the second policeman, as shown in Figure 7. These patterns suggest that, when Abdullah began to use a wider pitch span, he reduced pitch span in expressions referring to a given referent, like L1 Dutch speakers. However, in contrast to L1 Dutch speakers, he increased pitch span when introducing an accessible referent in addition to the use of expressions like andere and nog een. 33 ‘p’ stands for politieagent ‘policeman’; ‘m’ stands for ‘mention’. The digit following ‘p’ refers to the identity of the policemen; the digit after ‘m’ refers to the nth of mention. 34‘p’ stands for politieagent ‘policeman’; ‘m’ stands for ‘mention’. The digit following ‘p’ refers to the identity of the policemen; the digit after ‘m’ refers to the nth of mention. 35In total, 38 lexical expressions referring to the policemen occurred in Mahmut’s film retelling, 16 at the first longitudinal point (after about 15 months in the Netherlands), 10 at the second longitudinal point (after about 25 months in the Netherlands), and 12 at the third longitudinal point (after about 35 months in the Netherlands). Pronominal expressions were used once at the first longitudinal point (i.e. die) and once at the third longitudinal point (i.e. hij). Table 4 shows the distribution of nominal expressions (prototype: ‘politieagent’; other: ‘sheriff’, polijou - mispronunciation of ‘police’, pol - mispronunciation of ‘police’, baas ‘boss’, and politiebaas ‘policeboss’) and pronominal expressions at each longitudinal point in Mahmut’s production. As in Abdullah’s data, the nominal expressions occurred closely one after the other at all three longitudinal points. Mahmut also could use modifiers like andere ‘another’ and nog andere ‘yet another’ to introduce the second and third policeman already at the first longitudinal point. 36Mahmut’s data were similar to Abdullah’s data in terms of variation in position (61% in non-phrase initial final, 39% in phrase-final position), variation in grammatical role (subject – 74%, object - 5%, other - 21%), use of continuation rise and use of contrastive accentuation. A selection of nominal referring expressions was made for the phonetic analysis following the same criteria as in the analysis of Abdullah’s data. This selection consisted of five tokens of politieagent at the first longitudinal point, seven tokens of politieagent at the second longitudinal point and six tokens of politieagent at the third longitudinal point, as indicated in brackets in the second column of Table 4. 37‘Prototype’ stands for politieagent; other includes ‘sheriff’, polijou - mispronunciation of ‘police’, pol - mispronunciation of ‘police’, baas ‘boss’, and politiebaas ‘policeboss’. Pronominal expressions include hij ‘he’ and die ‘this’. The number of prototype tokens included in the phonetic analysis is indicated in brackets for each longitudinal point. 38Duration of politieagent varied systematically only at the first longitudinal point. Specifically, the first mention of the first policeman was substantially longer (> 29 ms) than subsequent mentions of the same policeman, as shown in Figure 8. This suggests that Mahmut decreased word duration in the presence of givenness. Further, the first mention of the first policeman was longer than the first mention of the second policeman, even though the latter occurred in phrase-final position. However, the second mention of the third policeman was longer than first mentions of the first two policemen. These conflicting patterns make it hard to interpret the effect of accessibility on word duration at the first longitudinal point. At the second and third longitudinal point, duration of politieagent varied between 202 ms and 349 ms but did not reflect change in information states. 39 ‘p’ stands for politieagent ‘policeman’; ‘m’ stands for ‘mention’. The digit following ‘p’ represents the identity of the policemen; the digit after ‘m’ stands for the nth of mention. to the identity of the policemen; digit ‘1’ after ‘m’ stands for the first mention. 40Pitch span was small at all three longitudinal points, varying between zero and 1.35 st. Although there were some variations in pitch span among the selected expressions, these variations did not correspond to change in information states. 41Our results show that Abdullah was able to adjust word duration according to the information state of the referent in a native-like way already at the first longitudinal point. But he exhibited progress in the use of pitch span over time. Specifically, at the second longitudinal point, he used a substantially wider pitch span. At the same time he began to adjust pitch span in the presence of givenness, like L1 Dutch speakers. At the third longitudinal point, he also varied pitch span to introduce accessible referents. However, instead of reducing pitch span to introduce accessible referents as in L1 Dutch, he increased pitch span. Interestingly, the progress in the use of pitch span was accompanied by infrequent correct use of the indefinite article een ‘a/an’ and overuse of the definite article de ‘the’ and the demonstrative pronoun die ‘this’ at the later longitudinal points. The results have three implications for Abdullah’s use of intonation in reference maintenance. First, the use of duration was acquired earlier than the use of pitch span. Second, learner-specific strategies were developed regarding pitch span. Third, the acquisition of the morphosyntactic device appeared to go in tandem with the acquisition of the use of pitch span. 42Unexpectedly, Mahmut exhibited a very different pattern than Abdullah. He used a rather small pitch span in general at all three longitudinal points. This might be because he has a small pitch span in his L1. Alternatively, the use of a small pitch span might indicate a limited degree of confidence when communicating in Dutch. This may be caused by lack of opportunities to use Dutch. According to the biographical records in the ESF database, Mahmut used Dutch only when coming into contact with the authorities and visitors of the Centre for the Unemployed in his town. In contrast, Abdullah used Dutch at different places, such as the Community Centre, the Centre for the Unemployed and the public library. He also read Dutch comics. In spite of the small pitch span, Mahmut still produced variations in pitch span. But the variations appeared to be random. As regards word duration, he seemed to vary it according to the information state of the referent only at the first longitudinal point. The loss of the systematicity in durational variations at the later longitudinal points is perplexing. Notably, Mahmut used no articles at all at the first longitudinal point but began to use the definite article and demonstrative pronoun at the second longitudinal point. There was an increase in the use of the definite article at the third longitudinal point, although it was used in both first and subsequent mentions of a referent. 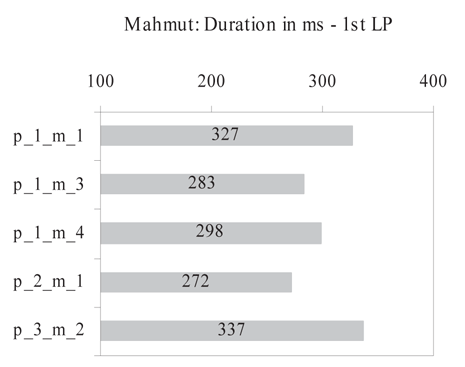 It would thus seem that the use of the morphosyntactic device for reference maintenance had a negative impact on Mahmut’s use of duration. 43Although results from two learners may not tell us a lot about the influence of L1, some speculations are conceivable. In Turkish, changes in information states appear to be encoded via intonation in addition to word order. Namely, constituents conveying given information are placed in sentence-initial position and probably spoken with a rising accent, whereas non-verbal constituents conveying new or contrastive information are usually placed in the immediately pre-verbal position or are realised with an obligatory falling accent when staying in situ(e.g. Kornfilt 1997: 506-507; Vallduví & Engdahl 1996; İşsever 2003). As the falling accent is supposed to be the most prominent accent in the sentence, it is very likely to be realised with a wider pitch span than the rising accent. We may thus infer that new referents are encoded with a wider pitch span than given and accessible referents in Turkish, as in Dutch. If L1 transfer took place, we would expect native-like use of pitch span for reference maintenance in both Abdullah and Mahmut. This is however not the case. Furthermore, Abdullah did not use pitch span to encode given referents in a native-like way until the second longitudinal point. This suggests that he may have acquired the use of pitch span for such a purpose in Dutch over time. In addition, Abdullah used pitch span in a different way from native speakers of Dutch to encode accessible referents. These facts together suggest that L1 transfer may not apply to the use of pitch span as a device for reference maintenance. 44We have investigated in two case studies how untutored Turkish learners of Dutch used intonational cues, i.e. word duration and pitch span, for reference maintenance in spoken Dutch at three longitudinal points in comparison to native speakers of Dutch. It was found that learners could use word duration for this purpose earlier than pitch span. Probably, variation in pitch span is subject to factors like degree of confidence in communication in L2 and speaker-specific pitch span, and is therefore harder to get under control for the purpose of reference maintenance. In the case of Mahmut, he was not able to vary pitch span according to change in information states even at the third longitudinal point. Furthermore, when pitch span was used, learners could develop a different strategy than native speakers of Dutch. This is evidenced by Abdullah’s production. At the third longitudinal point, he increased pitch span when introducing accessible referents, whereas native speakers of Dutch decreased pitch span. Apparently, for Abdullah the fact that a different individual came into the picture weighed more than the fact that this individual was inferable from the already activated referent. Moreover, the use of definite articles and demonstrative pronouns could have different effects on different learners. It went in tandem with the use of pitch span in the case of Abdullah but seems to have caused a set-back for the use of duration in the case of Mahmut. 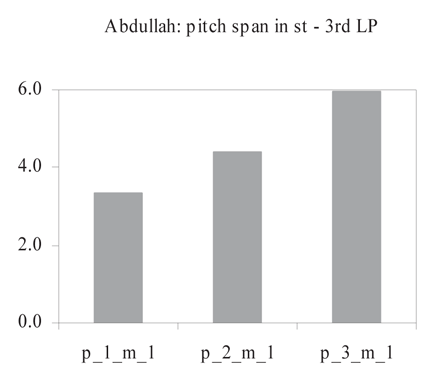 In addition, the development in Abdullah’s use of pitch span over time, the differences found between Abdullah and Mahmut, and the difference between Abdullah and native speakers of Dutch together suggest that similar usage of pitch span in Turkish is not automatically transferred to L2. Learning may therefore play a role in the use of intonation for reference maintenance in L2. 45As the current study is restricted in terms of number of Turkish learners of Dutch and amount of data, a larger set of data from more learners is needed in future work to establish the systematicity of the similarities and differences found between learners here. Moreover, analysis of the use of intonation in encoding information states in Turkish is desirable in order to have a clearer understanding of the effect of L1 influence. Furthermore, it would be interesting to investigate the extent to which the observed patterns are dependent on the L1-L2 pairing and whether some of the patterns (e.g. earlier acquisition of the use of duration than pitch) are independent of learners’ L1 and L2 by extending the current study to Turkish learners acquiring a language different from Dutch and a second group of L2 Dutch learners with an L1 different from Turkish. Our study has provided a useful method for these future endeavours as well as phonetically-oriented investigations of the interface between intonation and information structure in L2 in general. Acknowledgements: I thank Marieke Hoetjes, Rik van den Brule and Annemarie Frye for assistance in data collection, coding and annotating. I am grateful to Anetta Kopecka and Emilie Destruel for translating the abstract into French. I am also grateful to Christine Dimroth and Monique Lambert for their thoughtful comments in the course of the study. Portions of the data were presented at the special session ‘Information Structure in Learner Language’ at the European Second Language Association Conference (Eurosla), Aix-en-Provence, September, 2008, and the workshop of the European project group Learner Varieties, Paris, March, 2009. I thank the participants of both events for their useful feedback. Thanks also go to two anonymous reviewers for their helpful suggestions. Arnold, J.E. (2008). Reference production: production-internal and addressee-oriented processes. Language and Cognitive Processes n0 23 (4), 495–527. Baumann, S. & Grice, M. (2006). The intonation of accessibility. Journal of Pragmatics, n0 38, 1636-1657. Baumann, S. & Hadelich, K. (2003). Accent type and givenness: an experiment with auditory and visual priming. In M. Solé, D. Recasens, & J. Romero (Eds. ), Proceedings of the 15th International Congress of Phonetic Sciences, 1811-1814. Rundle Mall, SA, Austr. : Causal Productions Pty. Boersma, P. (2001). Praat, a system for doing phonetics by computer. Glot International n0 5:9/10, 341-345. Carroll, M., Murcia-Serra, J., Watorek, M., & Bendiscioli, A. (2000). The relevance of information organization to second language acquisition studies: The descriptive discourse of advanced adult learners of German. Studies in Second Language Acquisition n0 22, 441-466. Chafe, W. (1987). Cognitive constraints on information flow. In R.S. Tomlin (Ed. ), Coherence and Grounding in Discourse, 21-51. Amsterdam/ Philadelphia: John Benjamins, 21-51. Chen, A. (2009a). The phonetics of sentence-initial topic and focus in adult and child Dutch. In M. Vigário, S. Frota, & M.J. Freitas (Eds. ), Phonetics and Phonology: Interactions and interrelations, 91–106. Amsterdam: John Benjamins. Chen, A. (2009b). Perception of paralinguistic intonational meaning in a second language. Language Learning n0 59 (2), 367-409. Chen, A., den Os, E. & de Ruiter, J.P. (2007). Pitch accent type matters for online processing of information status: Evidence from natural and synthetic speech. The Linguistic Review, n0 24, 317-344. Chen, Yiya. (2006). Durational adjustment under corrective focus in Standard Chinese. Journal of Phonetics n0 34, 176-201. Chen, Yang, Robb, M.P., Gilbert, H.R., & Lerman, J.W. (2001). A study of sentence stress production in Mandarin speakers of American English. Journal of the Acoustical Society of America n0 109 (4), 1681-1690.
Cooper, W.E., Eady, S.J., & Mueller, P.R. (1985). Acoustical aspects of contrastive stress in question-answer contexts. Journal of the Acoustical Society of America n0 77, 2142-2155. Cruttenden, A. (1997). Intonation (2nd edn.). Cambridge: CUP. Eefting, W. (1991). The effect of "information value" and "accentuation" on the duration of Dutch words, syllables, and segments. Journal of the Acoustical Society of America n0 89(1), 412-424. Gullberg, M. (2006). Handling discourse: gestures, reference tracking, and communication strategies in early L2. Language Learning n0 56(1), 156-196. Gussenhoven, C. (2004). The phonology of tone and intonation. Cambridge: CUP. Hanssen, J., Peters, J., & Gussenhoven, C. (2008). Prosodic effects of focus in Dutch declaratives. In P. A. Barbosa, S. Madureira, & C. Reis (Eds. ), Proceedings of the 4th International Conferences on Speech Prosody, 609-612. Campinas: Editora RG/CNPq. Hendriks, H. (2003). Using nouns for reference maintenance: A seeming contradiction in L2 discourse. In A. G. Ramat (Ed. ), Typology and second language acquisition, 291–326. Berlin: Mouton. İşsever, S. (2003). Information structure in Turkish: the word order-prosody interface. Lingua n0 113, 1025-1053. Kornfilt, J. (1997). Turkish Grammar. London: Routledge. Ladd, D.R. (1996). Intonational phonology. Cambridge: CUP. Lambrecht, K. (1994). Information Structure and Sentence Form: Topic, Focus and the mental representations of discourse referents. Cambridge: CUP. Perdue, C. (1993). Adult language acquisition: cross-linguistic perspectives (vol.2). Cambridge: CUP. Rasier, L. & Hiligsmann, P. (2007). Prosodic transfer from L1 to L2. Theoretical and methodological issues. Nouveaux cahiers de linguistique francaise n0 28, 41-46. Ueyama, M. & Jun, S.A. (1998). Focus realization in Japanese English and Korean English intonation. Japanese and Korean linguistics n0 7, 629-645. Ullakonoja, R. (2007). Comparison of Pitch Range in Finnish (L1) and Russian (L2). In J. Trouvain & W.J. Barry (Eds. ), Proceedings of the 16th International Congress of Phonetic Sciences, 1701-1704. Dudweiler: Pirott. Vallduví, E. & Engdahl, E. (1996). The linguistic realisation of information packaging. Linguistics n0 34, 459-519. Véronique, D, Carroll, M., & von Stutterheim, C. (2000). Anaphoric linkage. Paper presented at the Euroconference: Information structure, linguistic structure and the dynamics of acquisition. San Féliu de Guixols, October. Watson, D., Arnold, J.E., & Tanenhaus, M.K. (2007). Acoustic prominence and referent accessibility in language production. Unpublished manuscript, University of Illinois at Urbana-Champaign. Wennerstrom, A. (1994). Intonational meaning in English discourse: a study of non-native speakers. Applied Linguistics n0 15(4), 399-420. Williams, J. (1988). Zero anaphora in second language acquisition. Studies in Second Language Acquisition n0 10, 339–370. Yeou, M. (2004). The Realization of Accentual Focus in Moroccan Learners of English. In B. Bel & I. Marlien (Eds.) Proceedings of the 2nd International Conference on Speech Prosody, 85-88. 1 The syntactic structure can also be varied according to the information state of a referent, but to a much lesser extent, compared to the lexical expression and intonation (Lambrecht 1994: 95). 2 Arnold (2008) used the term ‘degree of accessibility’ to refer to the degree of activation of a referent, and the term ‘acoustic prominence’ to refer to the gradient changes in intonation. 3 Here the phrase refers to an intonation phrase. The end of an intonation phrase is typically demarcated by lengthening of the final lexical word or a continuation rise or a pause.